Hoodoo Ski Area is only about 35 minutes up river from The Oregon Cliff House. First built in 1938, it now has 32 runs on over 800 acres. The 60,000 lodge has a restaurant, full bar, rentals, daycare and more. 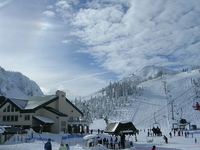 Located near the Santiam Pass, Hoodoo offers great snow and all the amenities you need for a great day in the cascades. Mount bachelor is located only about 35 miles from The Oregon Cliff House but is just over a two hour drive. Driving up past the head waters of the McKenzie river, you will drive through lava flats, Sister and Bend on a very scenic drive before arriving at Mt bachelor. It is the largest ski resort in Oregon by more than 1,000 acres and is the second largest single-mountain ski resort in the US behind Vail. Weather permitting it offers one of the longest seasons (Nov-May) and offers some of the finest snow.